Sony CMT-MX550I review | What Hi-Fi? If a star rating could be decided on the basis of looks and specification, the Sony CMT-MX550i would have pouched its five stars by now and we'd have moved on to something else. Just look at that photograph – the Sony looks purposeful but not intimidating. Its neatly integrated iPod dock is a particularly pleasing touch, and the speakers seem equally robust. 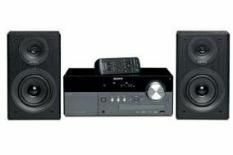 Specification is equally alluring: a claimed 60 Watts per channel of digital amplification, FM/DAB/DAB+ reception, iPod and iPhone functionality, CD drive, USB and 3.5mm inputs, a proper control… who could expect more at the price? However, a little poke around the MX550i takes some of that initial shine off the proceedings. For example, our review sample didn't sit foursquare on its feet, rocking a little under our fingers, and the speakers use a bespoke connection that precludes the use of alternative cabling. On the plus side, the MX550i is articulate and detailed with voices – an iPod-derived copy of Nick Cave's People Ain't No Good is served up with all its vocal nuance surviving intact. But either side of this sweetly realised midrange there's an uncouth clamour for your attention. At the top end, the '550i is thin, hard and sibilant to the point that cymbal hits sound like someone tapping on tinfoil. And when you move down to the bottom, the Sony's ill-advisedly confident: low frequencies are intrusive even with the equalisers backed right off, sounding soft and vague around the edges, and doing their damnedest to swamp all the good work that's being done in the midrange. For a company with Sony's pedigree and reputation, this is slapdash stuff.